About 65 km east of Mysore, you will find the tiny island town of Shivasamudram in Mandya district. Here the river Cauvery meanders to fall into cascading Shivasamudram Falls. This sparking waterfalls flows through the abundant sylvan forest of Karnataka in Deccan Plateau, plunges 320 feet into gorge into a spate, breaking into a cloud of misty foam. The falls are 893 metres wide. In the Western Ghats of Kodagu district at Talacauvery, river Cauvery emerges and meanders to join the Rivers Harangi, Hemavathi, Lakshmana Thirtha and Kapila creating a number of waterfalls. Cauvery forms many islands throughout its journey from Talacaurvery to the Bay of Bengal. One such island is Shivanasamudra or Bluff. At Shivasamudram also called Bluff or Simsha, this waterfalls has twin jumps, the Gagana Chukki or the Western falls and the Bara/Bhara Chukki or the Eastern falls. Monsoon season(during the month of July and August makes this waterfall swell to enormous proportion when the river Kabini floods along with Cauvery creating a waterfall perhaps a thousand feet wide. The Hydroelectric power stations are the first of its kind in Asia, in 1902, is still functional. It was commissioned by the Diwan of Mysore, Sir K Seshadri Iyer. The first town to receive the electricity from this station was Kolar Gold Fields, hence Kolar became the first town in Asia to get hydroelectricity. 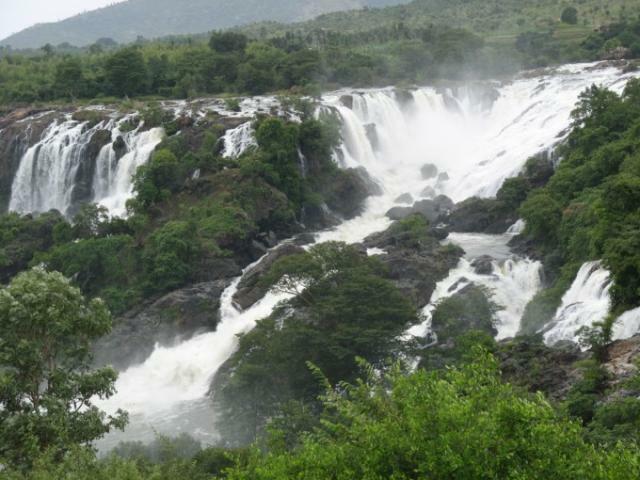 Trekking: One needs to trek 2kms through the lush greenery, along the banks of Cauvery to approach the falls. Sitting on the benches provided at the watch tower you can reveal the beauty of the river plummet into a spray of mist. One Day Trip: One can visit the Somanathpur Temple, Shivanasamuram, and then visit Talakad (35 km ) One can find accommodation and food at Talakad. Best Visiting time: June to September ( the waterfalls looks full and gorgeous during this season). The climate is the moderate entire year. By Road: 65 km from Mysore. 139 km from Bangalore (Bangalore-Maddur-Malavalli-Sattegala-Bluff), 35 km from Talakad.